Despite advances in technology, particularly among organisations, local councils continue to store past planning applications on microfiche. We think it's time councils moved forwards. 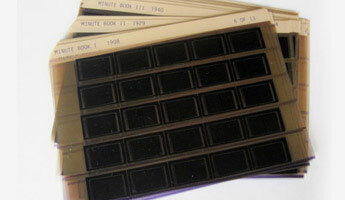 Microfiche have been commercially used for storing documents since the 1920s because they were the most space saving solution for file storage. However, since the rise of the digital age, microfiche are no longer the best solution. So much so, microfiche and everything that comes with them are becoming obsolete. Scanning and digitising planning applications to be placed onto a digital document management system completely banishes storage costs but it also brings other advantages too. Digital planning applications are easier to search, especially one they have been fully indexed. You will be able to find the documents through a simple text search for names, title or dates, among others. The digital documents can be accessed from anywhere, at any time, especially if they are placed onto a cloud platform like Pearl Cloud. The files can be shared with the necessary people whether through email or giving them access to the password protected files. You can also put the digital copies on websites so the public or interested parties can view planning applications online. Here at Pearl Scan, we understand the need for secure document storage for planning applications so we offer document encryption and password protection with our scanning services. Many businesses and organisations are already seeing the benefits of microfiche scanning so why not jump on board and reap the rewards yourself. If you would like some more information on how you can hire our microfiche scanning services for scanning planning applications stored on microfiche, get in touch today. For a free, no obligation quote for you microfiche scanning project, complete the online 'request a quote' form by following the relevant links below.